Caledonian Hotel Enthusiastic husband and wife team, Bruce and Wendy, purchased the Caledonian hotel Bar & Restaurant in Dumfries in November 2015. At that time it was operating as the Moreig hotel and Bruce and Wendy were keen to rebrand it as the Caledonian and revamp it in a variety of exciting ways. Firstly the building was refurbished to smarten up a somewhat tired hotel to create a fresh new look. The restaurant and function suite had a makeover, as did the bedrooms which also had a technology upgrade with flat screen TVs and high speed broadband being installed. Next came the menu – new Head Chef Martin introduced a tempting menu using high quality local produce to create the delectable homemade dishes the hotel is now known for. His high quality meals delight the customers and keep them coming back for more! The function suite at the Caledonian Hotel is ideal for private gatherings such as wedding receptions, funeral receptions and parties. Set in a grand Victorian Villa, the hotel incorporates a restaurant, bar and function suite. The en-suite bedrooms are equipped with digital televisions and free high-speed WiFi, tea/coffee making facilities, a hairdryer, and an ironing board. The Caledonian Hotel's restaurant offers a modern British menu and the bar has a selection of beverages and wines.Guests can enjoy 15% off the lunch and dinner menu at the restaurant. The Dumfries and Galloway Aviation Museum is 3 miles from the Caledonian Hotel, and Caerlaverock Castle is 8 miles away. Guests can enjoy golfing, hiking and swimming in the area surrounding the property. 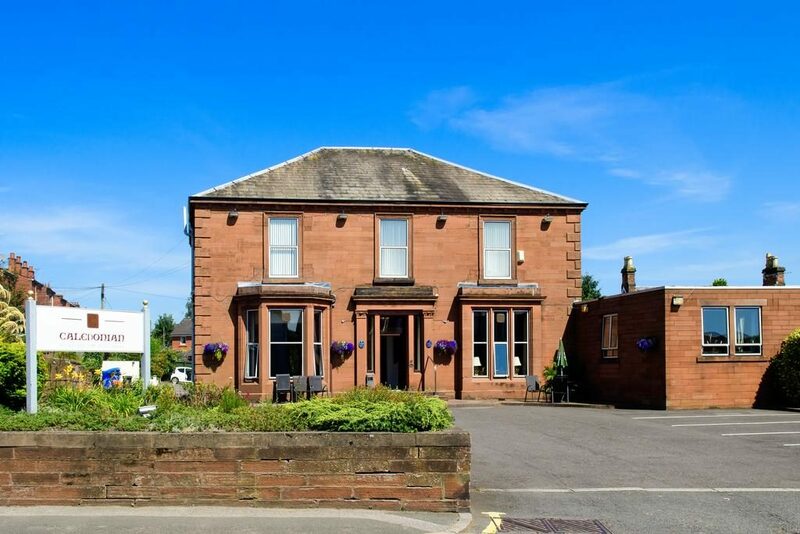 The hotel is situated 10 minutes' walk from Dumfries Railway Station, offering trains to Carlisle and Glasgow, and it is a short drive from the A75.